In the past four years, I've watched these girls go from two girls who were basically indifferent to each other to sisters who run around the house screaming and laughing hysterically over the silly games they've made up together. Librarian, Thug, Mom, and Writer of 649.133: Girls, the Care and Raising Of. The girls spent most of the day playing together all over the house. Phaedra put on a little show they call "Circus" for Bella while she took her bath. They sifted through the enormous pile of little figures and dolls and found the Special Agent Oso toys, reenacting an episode together before bedtime, each girl cracking up at the other one's silly song or plot twist. When I asked Phaedra to clean up her room before bedtime, she decided she wanted to make Bella's bed for her. She spread the blanket, arranged the pillows just so, and placed a few of Bella's favorite stuffed animals on top of the pillows. She couldn't wait for Bella to see it. When bedtime came, they asked to sleep together in Phaedra's bed. Although I vetoed it (because I prefer that they fall asleep before 2 a.m.), I nearly changed my mind when they walked hand-in-hand to Bella's room for the big reveal. Like I said, today was nice. Tonight, however, was not as nice. Bella was tired, and she's going through a bad cycle, as autistic kids tend to do, where things that were previously not that big of a deal are suddenly an enormous, tear-filled battle. Just getting her up the stairs to the bathroom to brush her teeth was a 10-minute ordeal filled with pleading, cajoling, and slightly raised voices. So when Phaedra kept telling Bella that she had put Bella's pink frog on her bed, Bella insisted that it was not there. When Phaedra proudly showed Bella what she had done for her as a special surprise, Bella rushed over to the pink frog, yelled "NO!" and started tossing the painstakingly arranged pillows and stuffed animals off the bed. In Bella's mind, her bed looked different; it wasn't "right." "Not right" is upsetting. "Not right" is frightening. Bedtime is a hard transition for her to make, so everything needs to be exactly the same every single night to make things go as smoothly as possible. A detail I forgot until the second that pink frog flew past my head as I turned to see Phaedra's face fall from anticipated delight to hurt, confused anger. "Everyone has a cup in their head. We pour all of our feelings, like happy, sad, mad, scared, anything, into that cup. Most people have regular-size cups. When you pour out your feelings into your cup, you have more than enough room for them. Bella has a cup, too, but her cup is little. When she pours her feelings out, her little cup can't hold all of them, and it overflows. Does that make sense, honey?" Apparently it did, because she uses this story to explain to others how Bella is different. She shares it with teachers, friends, basically anyone who will stand still and listen to her talk about her family. "My sister Bella has a little cup." Since Bella started preschool, her social skills and communication have steadily improved. Part of that improvement is due to the new educational program and therapies she receives at school, as well as the incredible teachers and therapists carrying out those services. There is someone else who also deserves credit for the huge leap forward Bella has made verbally and socially this fall: Phaedra. 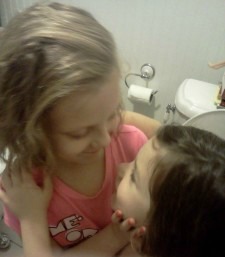 While Bella gets speech and occupational therapy at school, she gets play therapy at home with her bossy older sister. Phaedra instructs Bella on how to play games and act out scenarios. She tells her what to say, what to do, and how to do things that other kids naturally know how to do. 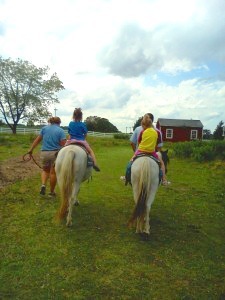 When I describe how Phaedra plays with Bella to her therapists and doctors, they are tickled and amazed. But no one is more amazed or tickled than I. In the past four years, I've watched these girls go from two girls who were basically indifferent to each other to sisters who run around the house screaming and laughing hysterically over the silly games they've made up together. "OK, Bella, now you be Snoopy, and I'll be Lucy this time." 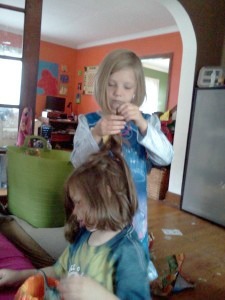 "Bella, do you want to play beauty shop?" Shortly after I wrote about Bella's diagnosis, I was chatting with a friend about their own experience with an autistic sibling. I told her about my worries that autism would ruin my girls' chances of being close, of having a great relationship. I told her I feared that Phaedra would resent Bella or be jealous of the attention she received, that they wouldn't get along and would be embarrassed of each other as they grew older. "But that stuff happens with ALL sisters. Do you really think if Bella was an average girl, they wouldn't have those problems?" She's right. Sisters fight. They argue, they grow jealous of one another, they slam doors, they poke, they bite, and at times they firmly believe their life would be better off without their sister. 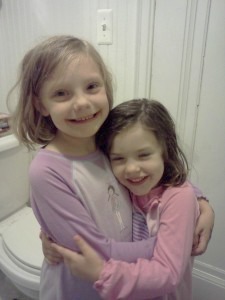 They also hug, hold hands, giggle, perform crazy news shows, and help each other. They want to do things together, and worry when one is away. They're not best friends every single day, but they're also not just two people who happen to live in the same house and share the same parents anymore. This piece is part of a series of essays on what autism looks like for different families. Follow Janel Mills on Facebook and Twitter. You can also read her essays in I Just Want to Be Alone and You Have Lipstick on Your Teeth.